Royal protocol breached - Read How!! The royal protocol saw a 'flirting' breech and caught on camera during the ongoing visit of Prince Charles and the Duchess of Cornwall in Sydney as part of their Australia and New Zealand tour. 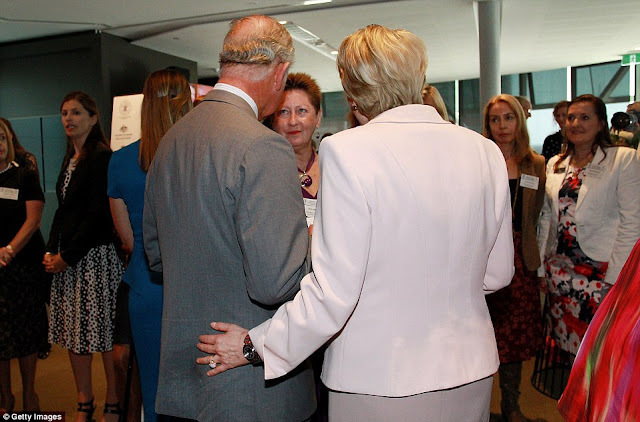 During visit, Janine Kirk may have broken protocol by appearing to place her hand on Prince Charles' backside - something that is being considered too intimately close to a royalty. Ms Kirk in the chief executive of The Prince's Charities Australia, and was with Charles at a Sydney meeting.